I know you may just now be starting your summer reading, but vacation is almost a wrap and school is almost back. While your parents may be rejoicing, you probably don't feel ready. True, some of you may be eager to see your friends again and enjoy the rhythms and rituals of middle and high school life. But most of you probably prefer the pace and privilege of summer break. Yet, like most good things, your sabbatical is coming to an end and mid-terms are right around the corner. I admit, I don't envy you. I am grateful my public education days are in the past and the pressures of exams, peers, lunch tables, homework, and whether or not I brought my gym uniform or protractor are bygones. I also admit, I do envy you. There is a part of me that misses the days when every day I was surrounded by loads of people. Granted, some of my peers caused great fear, angst, and stress. Still, every day was an opportunity to be in the presence of another individual who was questioning, struggling, wrestling, celebrating, and walking through life in a way similar to me. It was also an incredible age of self-discovery. So however you feel about back-to-school season, my prayer is for you to live in the moment. The future will be here before you know it (which is 2015 according to Marty McFly) and you won't be able to get the precious days of your youth back. So make the most of it, not YOLO style with irresponsible and reckless behavior, but with the realization that NOW is your time to reflect the love and light of Christ. Love the freshman and sixth grader. They once were you. With hallways like labyrinths and upperclassmen who seem like giants, being the youngest of blocked-schedule pilgrims can be terrifying. Befriend them. Help them. Lead them. Stick up for them. Be sure they know they will not spend their days stuffed in a locker somewhere or without lunch money. But if you do see this as a posed risk, step in and claim them as though they were family. And if you happen to be one of these young nomads, be sure to find an older peer you can trust who can show you the way. Know that you are loved and your time will come when you can look below and be the one to offer a helping hand up. Blessed are the peacemakers. I wish I could say schools are increasingly safe, but they are not. Teenagers are finding new ways to diminish, harm, violate, and bully the humanity of others. Respond not with hate but as a peace-maker, love-giver, hope-sharer, grace-bearer, forgiveness-offerer, and one who speaks up for those so often pushed around as though yesterdays garbage. We are our brothers' and sisters' keeper. This may mean editing your tweets, restating your posts, deleting texts, and refraining from sending those images through apps claiming deletion within nano seconds. Use technology to build others up versus tear them down. While the temptation may be to participate in seemingly harmless social-media tirades and gossip, things can go viral quickly and cannot be undone. Instead, tweet encouragement. Post articles that promote justice and peace. Blog about resurrection stories of hope and generosity. Instagram a friend with a tag about their brilliance and creative reflection of grace and kindness. May news feeds of love and #compassion begin to trend on-line, especially among your peers. Read. Rest. Pray. Consider a new way to be centered on the person of Jesus and the Spirit who sends you into school each day. Read a Scripture each morning before homeroom. Allow prayer to be engaged for more than a test you did not study for. Use bus rides to lift up classmates, teachers, administrators, coaches, friends, enemies, and those you have yet to meet. Take time to rest, too. You cannot and should not be constantly on the go. You were not made for that. Adults need to remember this, too! Here is a link to some excellent devotional resources: What's A Good Devotional? Trust God to use you as a witness. Consider how your gifts, talents, athletic and artistic abilities, and simple reality that you encounter hundreds of people each day can be platforms to share the good news of Jesus with another. May the way you perform on the field, rehearse on the stage, walk the hallways, interact with faculty, and even your choice of lunch table companions mirror the Spirit of Christ who dwells within you even beyond youth group. These are great words of encouragement, Greg. Thanks for sharing, and it will be required reading for the McGovern girls! 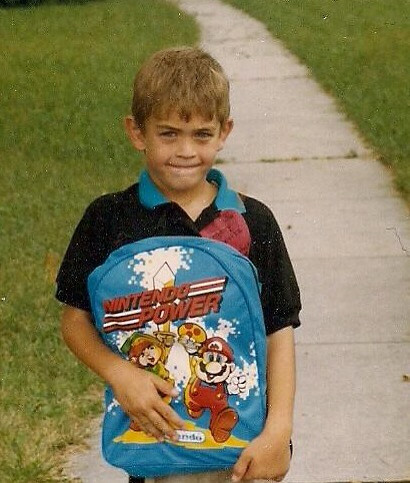 PS - that Mario backpack is really cool!